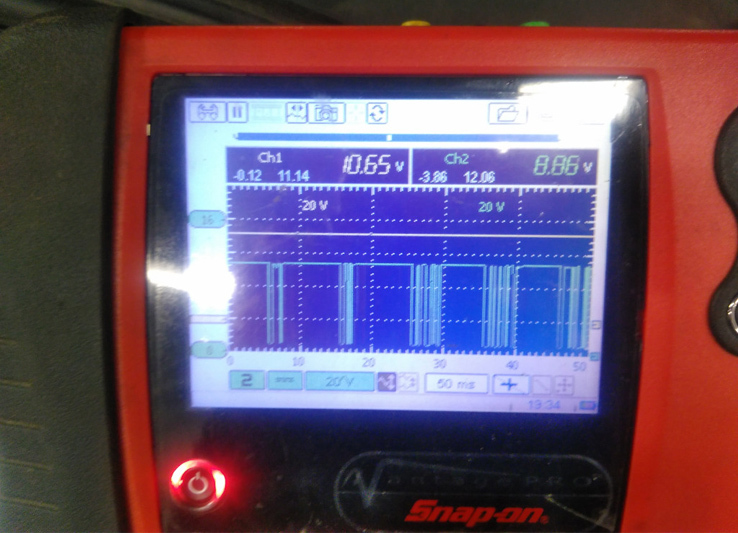 Anthony Pickering recounts a recent case where his oscilloscope came in handy with diagnosing an A/C pressure sensor fault. An Audi A6 recently entered the workshop with an air conditioning operational fault. Popping a set of pressure gauges on the A/C pipework showed no pressure activity on command, just a 5 bar rest pressure on the high and low gauge. I conducted a global code scan, which revealed some fault codes. Two codes of interest were stored – one for A/C: ‘function limited to malfunction signal’, and one in central electrics: ‘AC pressure/temperature sensor no communication’. Looking at a wiring diagram, the A/C pressure sensor has a battery voltage feed, an earth and a LIN signal wire. This LIN signal is also at the air quality sensor. 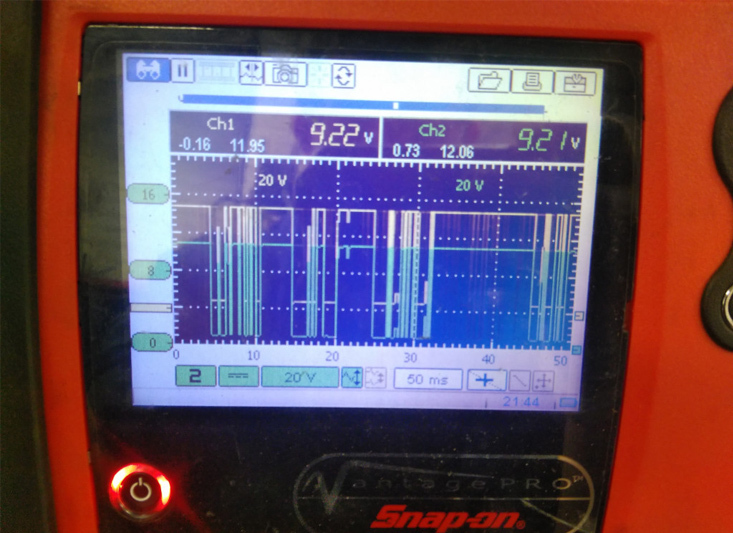 Accessing the sensor using an oscilloscope, I found a good battery voltage and a good ground at the pressure sensor, but on the LIN wire I had a 10.6V flat line. A LIN signal should be a fast switching 0-12V signal, so a 10.6V flat line is indicative that there is no LIN signal. Given that the air quality sensor also has a LIN signal to it, I checked there as well to see if there was a LIN network signal present. There was a good clean signal (see below) in comparison to the pressure sensor. 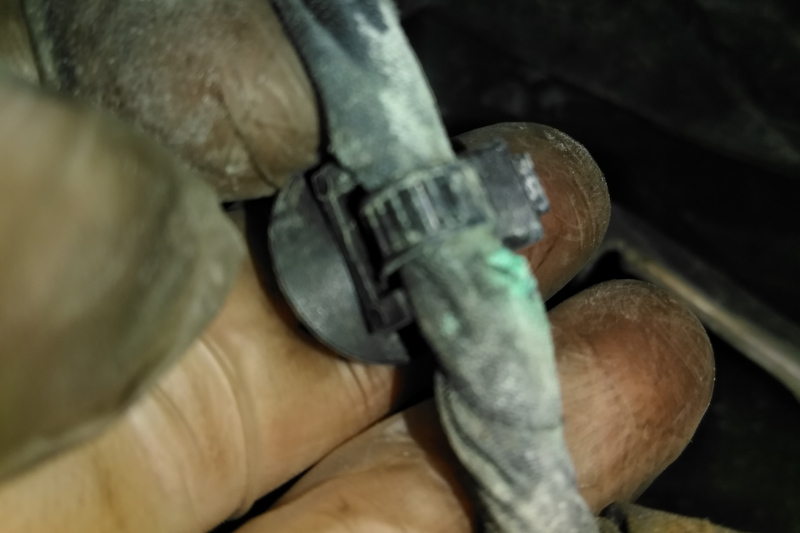 So the network signal was strong at the air quality sensor, and as the central electrics did not log a code for the air quality sensor, I suspected it was a wiring issue between a splice and the A/C pressure sensor. Following the wiring harness from the sensor, I noticed some green staining on the fabric insulating tape (see below). Opening up the insulation, I found a corroded point within the signal wire. The next step was to perform a wiring repair to the manufacturer’s specification, before checking with the scope again. Sure enough, a good LIN signal was now present at the A/C pressure sensor (see below). Live data showed an A/C pressure reading of 5 bar rest pressure and 12 bar with the A/C in operation. The codes were erased and did not return.